Grasshopper is ideal for entrepreneurs or small teams. As a Grasshopper customer, you can select as part of your business phone service, text messaging, local phone number, a toll-free number, and more. Read our full review below to find out if Grasshopper is the best fit for your business phone service needs. 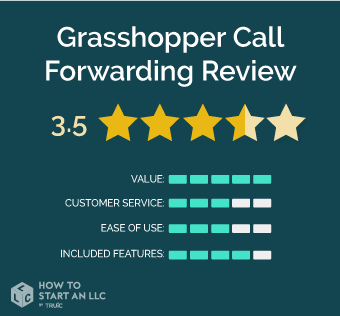 Grasshopper offers a high quality call forwarding service, available through calling a specific number, or mobile applications for outgoing and incoming calls. Out of competitors such as eVoice and Talkroute, Grasshopper stands out by offering the possibility of optional, additional features like unlimited text messaging for phone numbers on your plan and is owned by Citrix, a long time, reliable telecommunications company. However, these additions can be quite expensive over time, as this feature alone adds $10/phone/month to use it. Who is Grasshopper right for? Grasshopper is ideal for new entrepreneurs or small teams that need a reliable, simple solution for their calling, and who intend to fully use systems like unlimited texting or other such, a la carte features. There is not a per-user charge on Grasshopper plans, which allows you to add as many users as you need, without worrying about extra fees. This is not the case when using many of the other companies we reviewed. 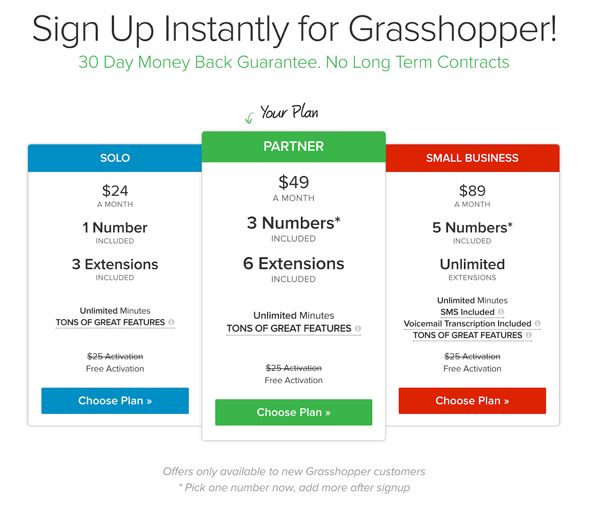 While Grasshopper does not offer a free trial, their service comes with a 30 day money back guarantee, with a full refund available if cancelled within that time period. While there is a professionally recorded greeting service available via Grasshopper, a recorded greeting, or set of greetings, do not come with either of the higher tier plans like competitors such as eVoice, Nextiva, and Talkroute. According to many online reviews, while Grasshopper’s customer support team seems responsive and capable, there have been reported billing problems and issues in the product that should not need a call to customer support to manage (such as voicemail management). Grasshopper offers multiple pricing tiers. The most basic tier is the Solo plan, an entry-level plan for solo entrepreneurs who need a professional phone number. The top tier is the Small Business Plan, which can accommodate a lot of team members with their own extensions. Take a look below for the calling features that come with Grasshopper, and what offerings come with their various packages. Who should purchase the Solo plan? The Grasshopper Solo plan is meant for exactly that: solo entrepreneurs, freelancers, and single small business owners looking to establish a professional phone number and appearance separate from their personal number. Even at this level, Grasshopper includes unlimited minutes and many features you’d expect from a phone system, such as an auto-attendant phone menu system for your callers. Who should purchase the Partner plan? For teams that are bringing their own devices and need a few more phone numbers and extensions for different departments or just more than one teammate on the system without needing to worry about tracking the number of minutes spent calling. Finally, if you’re looking to have a few more team members, a large number of people who can be assigned their own extension, or teammates who need to text their clients or customers a lot, the small business plan would work best for you. With unlimited minutes, and access to Grasshopper’s full set of features on even the lowest cost plan, the price for all that you’re receiving is well worth it. Grasshopper’s customer service has not received many glowing reviews from customers online, and the help center provided by their team does not lay out a clear picture of how the system should be set up and why. While it does show how things are done within the system, there is not a good education element that helps tie everything together past a series of setup guides for specific configuration. Phone systems can take a little getting used to in terms of management, and Grasshopper’s administrator menu system and lackluster help center do not help in understanding how it all comes together. Grasshopper offers a very comparable set of features to other phone systems. The tiers of different amounts of available phone numbers make sense for the number of users intended for each level.